When we first got Sherman and Leroy ninety percent of our house had carpet. After a few years of having Sherman and Leroy and dealing with the dust, dirt, and dander collecting in the carpet, we ditched the carpet in most of the rooms and went with laminate flooring. Not to mention they both preferred resting on our ceramic tile any day over resting on the carpet. A few years after having the laminate, we started seeing the downfalls. Slipping was a big one so I quickly bought carpet throws, carpet squares, and indoor/outdoor rugs to help them keep their footing. Besides the indoor/outdoor rugs, I didn’t spend much money on the throw rugs. I would just replace them as needed. If a dog peed on one, throw it out and run to the store and grab another cheap. I gave up trying to match them years ago. We just have an abstract array of throw rugs and carpet squares randomly placed around the house. Now that both the boys are seniors, we don’t just have slipping on the floor to worry about, we worry about them being about to get enough traction to get up. 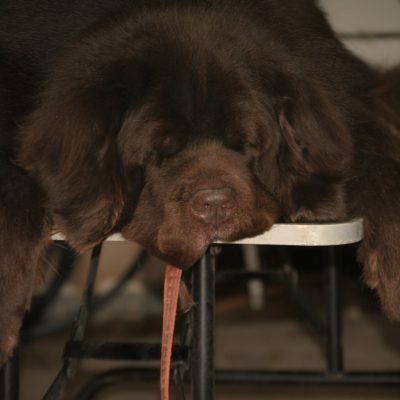 And since they are Newfies, they don’t exactly want to be laying on a carpet of any kind most of the time. This one is obvious. If you don’t want a rug to slide when your dog walks on it or tries to get up from sitting on it, buy a non-slip rug. These rugs will have a rubber backing or latex backing that prevents the rug from slipping when stepped on or from moving when a dog gets up from laying on it. We have 2 indoor/outdoor rugs that are non-slip. We keep them by the doors that Sherman and Leroy use the most. They aren’t pretty but they don’t slip and they are great for catching water, mud, and debris that the dogs bring in. Non-slip runners are also a great rug to have for long stretches of floors. 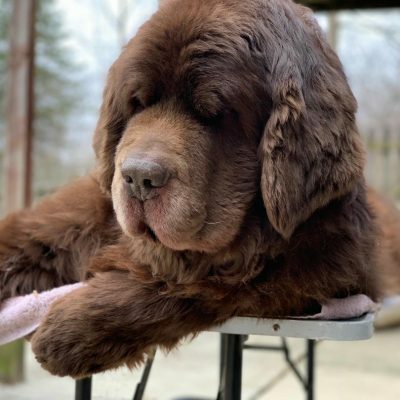 They may not cover a large area but most dogs that are having traction issues will learn pretty quickly that walking on the runner is less slippery. Rug pads come in different shapes and sizes and can be bought at most home improvement stores, online, or at some carpet stores. If you can’t find the correct size rug pad you’ll need to measure your rug and cut the pad to fit. Next, you’ll have to adhere the pad to your carpet using double-sided carpet tape. You can get rubber rug pads, felt rug pads or eco-friendly rug pads. There is also professional rug tape that is double-sided that claims to be safe on all surfaces including wood, tile, stone, laminate, mats, and carpet. I had a small tantrum last week at one of our long throw rugs. This particular rug sits in between carpet squares and an outdoor/indoor mat. I fix this rug at least 20 times a day and I’ve tried to wedge it under the other rugs to get it to stay but it ALWAYS moves. I had enough so I grabbed a few bottles of acrylic caulk from our local hardware store and caulked lines every 6 inches on the back of the rug. I let the rug dry for 24 hours and put it to the test. It’s not a 100% non-slip but it hasn’t slid underneath the couch since I did it and I call that a win! It slips a little bit if I step on it and try to make it move but it doesn’t move when Sherman or Leroy walk on it or when Leroy rolls all over it after he comes in from being outside. I think if I went back and laid some caulk around the perimeter it might help. 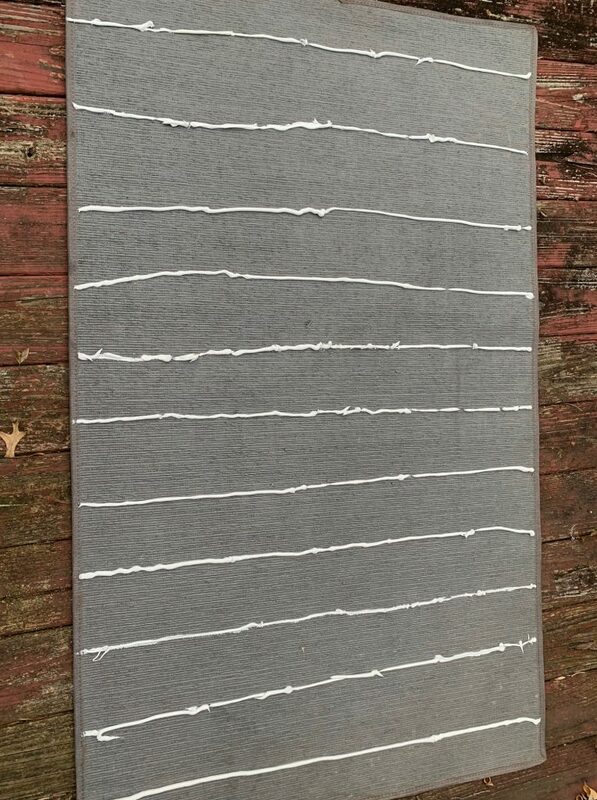 You can also use a hot glue on the underside of a rug and running the glue along the perimeter and then lay strips about every 6 inches or so and allow to completely dry. Rubber shelf liner is also an easy DIY that you can try on the back of your throw rug. Simply measure the amount that you will need for your rug, cut to the correct size, lay the shelf liner down on the floor and place the throw rug over it making sure not to wrinkle the liner. 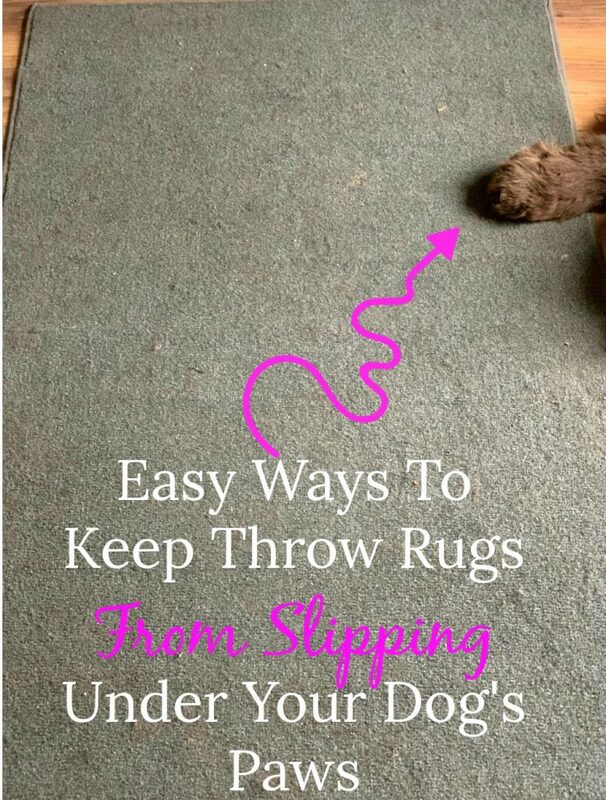 Having non-slip throw rugs in your home when you have dogs can be a great way to avoid injuries that may be caused by slick laminate floors or ceramic flooring. 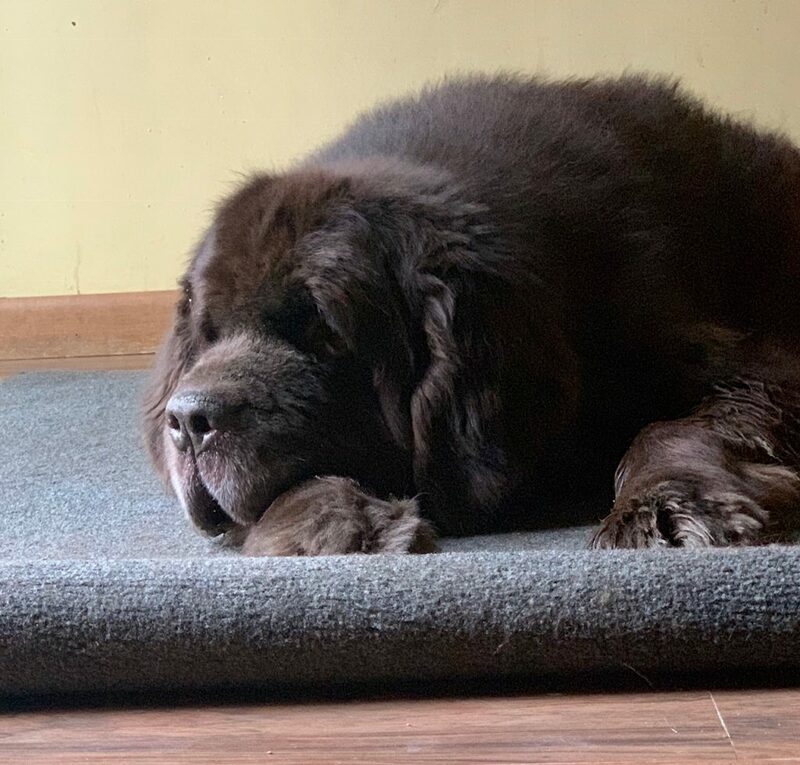 Non-slip rugs can also be a blessing when you have senior dogs that are struggling to get up and move steadily on their feet and for puppies that have yet to find their coordination skills. Along with securing our rugs and using the new dog socks we’ve just about senior proofed our house. We have linoleum in both the kitchen and bathroom – the rest of the house (except for the floor under the washing machine and dryer) is all wall-to-wall carpeting. As Callie and Shadow got older, the carpeting was a blessing. But I struggled to find throw rugs that would stay put on the linoleum, even the ones with rubber backing. 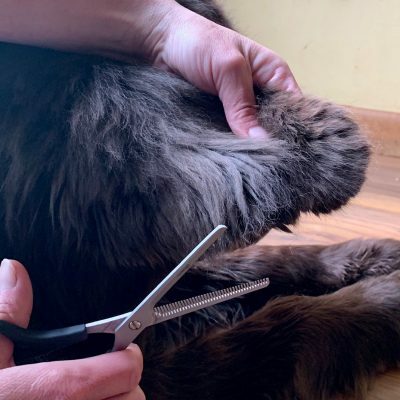 That’s when I decided to get the paw socks for Shadow – she didn’t start having issues until after Callie got her angel wings – and tried to remember to trim the furs between her paw pads. Ducky still gets the zoomies inside the house, but she doesn’t slide as much as her sisters did. At some point I may need to get her some non-slip socks, too; but hopefully not in the near future.